TJ's glowed brightly on the main street of a small Vermont river town. It's emptiness contrasted with the pull of its strong lights. Long, lonely roads on the high plains of Colorado let you see storms rolling toward you from miles away. Summer clouds low on the horizon build toward an evening storm. 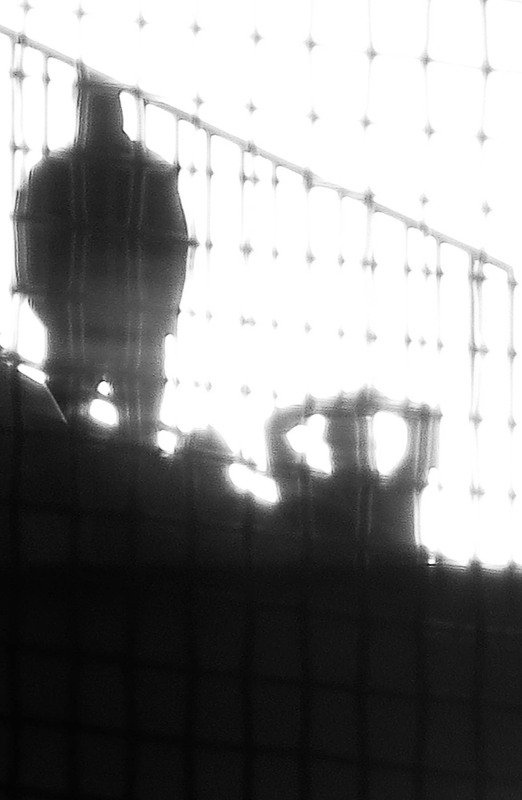 Behind chain link, silhouetted against the light, figures appear trapped. Most people share basic life experiences of childhood, adulthood, old age, joy and sadness, triumph and failure. 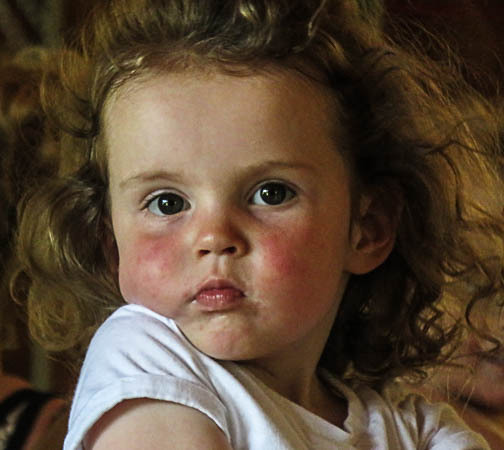 In unguarded moments their experiences can sometimes appear on their faces for the photographer to recognize and record, thus to share in the experience and pass it on to others. 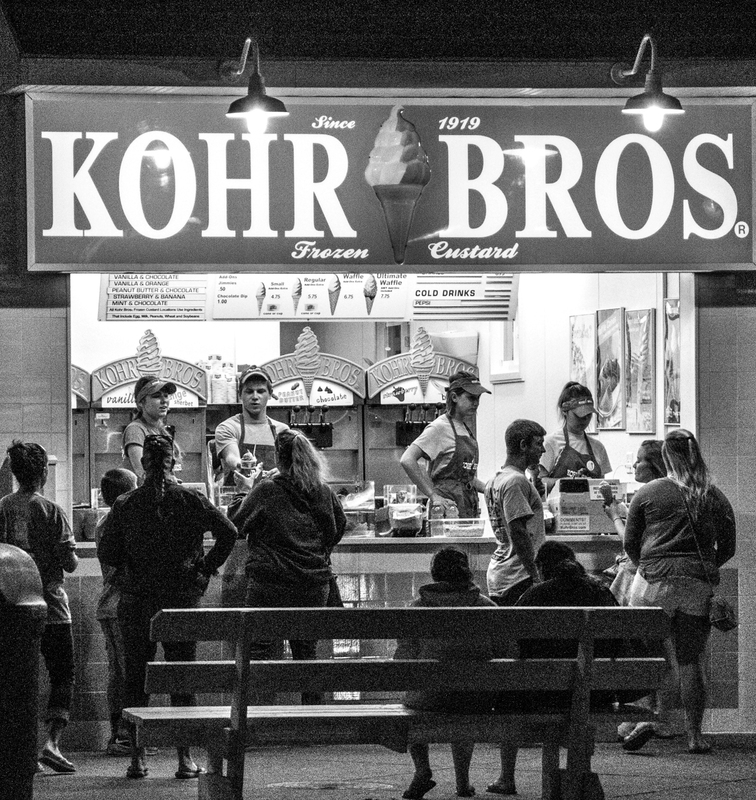 Street photography offers endless opportunities to witness the flow of life through public spaces around us. A camera paradoxically separates the photographer from the subject only to thrust the subject of the photo into a larger world to connect with a multitude of viewers. All of the photographs in this project have been made in the last two years with a Canon 5d iii and a 24-105 lens. They are a marked departure from my earlier photographs concentrating on architecture and landscape. Young children are not always laughing and active. Nor are they always petulant and crying. There are moments when they become quiet, mysterious, and seem to view the world with preternatural calm. 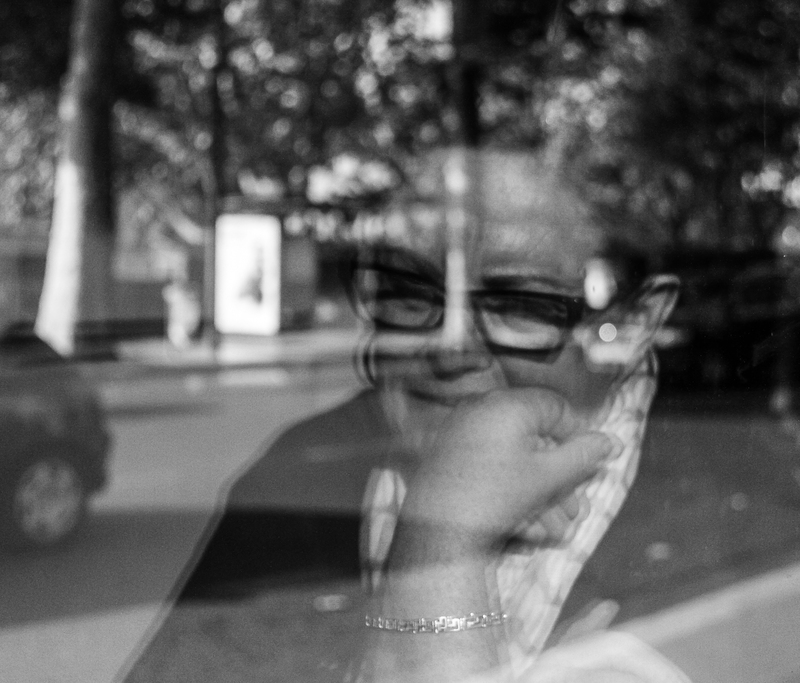 A Parisian cafe is a perfect place to ponder the mysteries of life over an espresso or kir. Trams and trolleys bring all types of people through the city. A photographer only has to wait to meet the world. 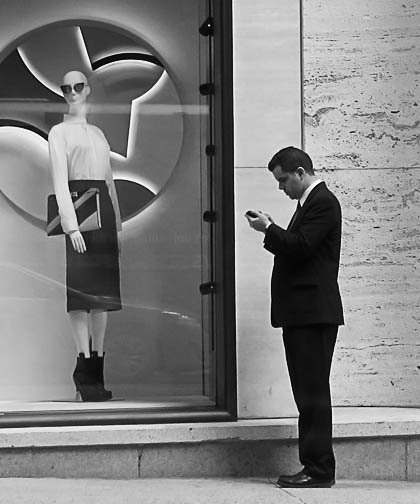 Wherever people possess smartphones we see them motionless, frozen in place, in prayerful communion with this tiny device, linked to what or whom. For at least a moment these figures face one another like mannequins in a window display. In the maelstrom around Madison Square Garden commuters and travelers rush to and from the trains, taxis, and buses. Stress and anxiety marks their faces. The irony of the theater marquee is unmistakable. Perhaps this woman felt threatened by a photographer standing in the darkness beside the trolley line in New Orleans. Others were oblivious or unconcerned. A smartphone can be a refuge, a connection beyond the boredom of an airport waiting room, or a connection to an absent friend. The user is wrapped in a protective cocoon. An elderly man sat on this rock most mornings and evenings during my stay on the coast of Portugal. 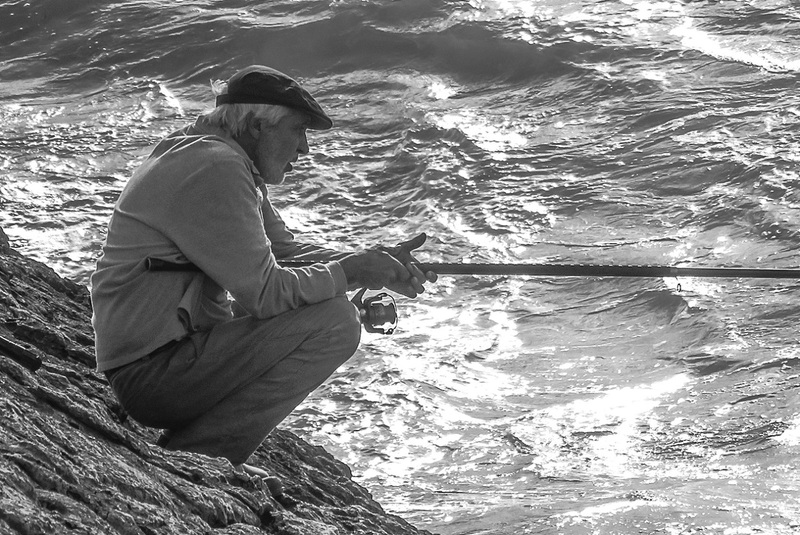 He did not seem to talk with the other fishermen. He sat patiently in the same position at the same spot each time. I never saw him make a catch from the surf below. He seemed to be meditating more than fishing. A mature woman's curves surrounded by swirling fabrics with accents of flame red. We are part of nature and enmeshed in its beauty and ugliness. Entrancing, even awe-inspiring nature, was a primary motivation for my earliest serious photography. Although I have concentrated on other subjects recently, I continue to find inspiration in the beauty of the natural world, in my backyard garden and beyond. 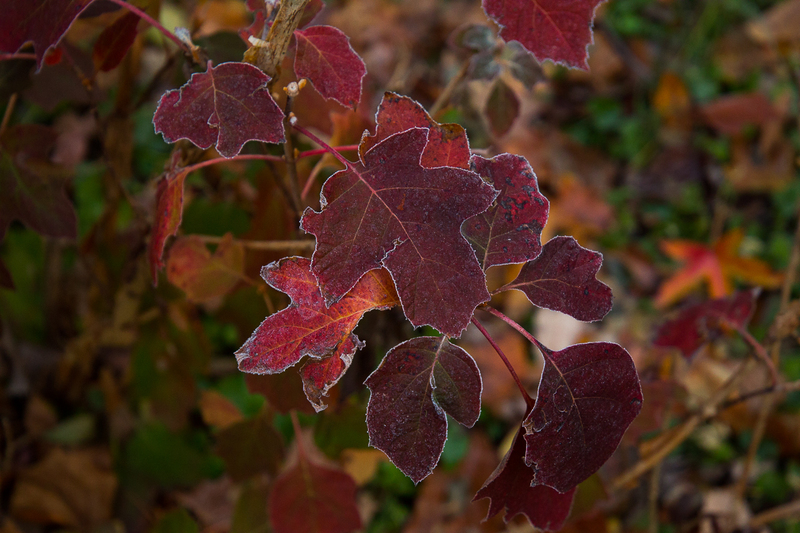 Freezing temperatures following a rainy day edge vibrant red leaves with crystals of hoarfrost. Momentary beauty marking the seasonal transition. 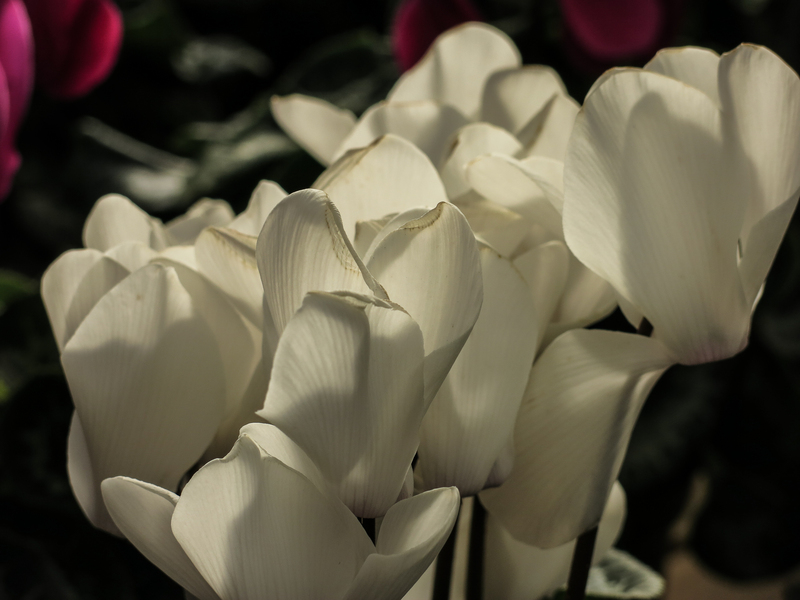 Morning light traces the delicate veins of cyclamen. In the clear waters of Green Bay, Wisconsin the hard granite stone bottom backdrops swirling reflections of shoreline saplings. Nature creates its own calligraphy in light and shadow. 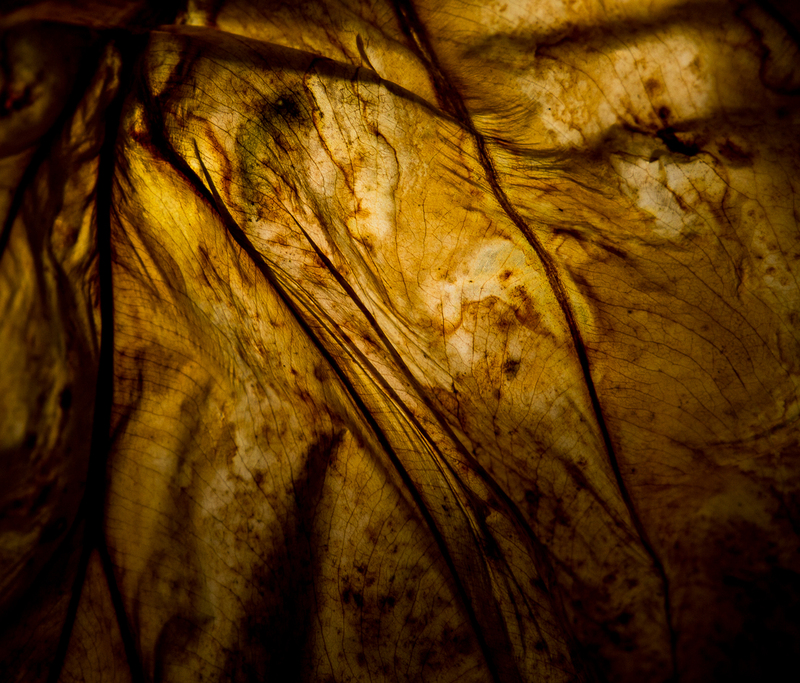 Parchment thin, dried and desiccated, leaves assume a new kind of beauty. Like us, all living things transform throughout life, and beauty itself is transformed. The setting and rising sun bathes even the most ordinary things in a wash of pulsating warmth. 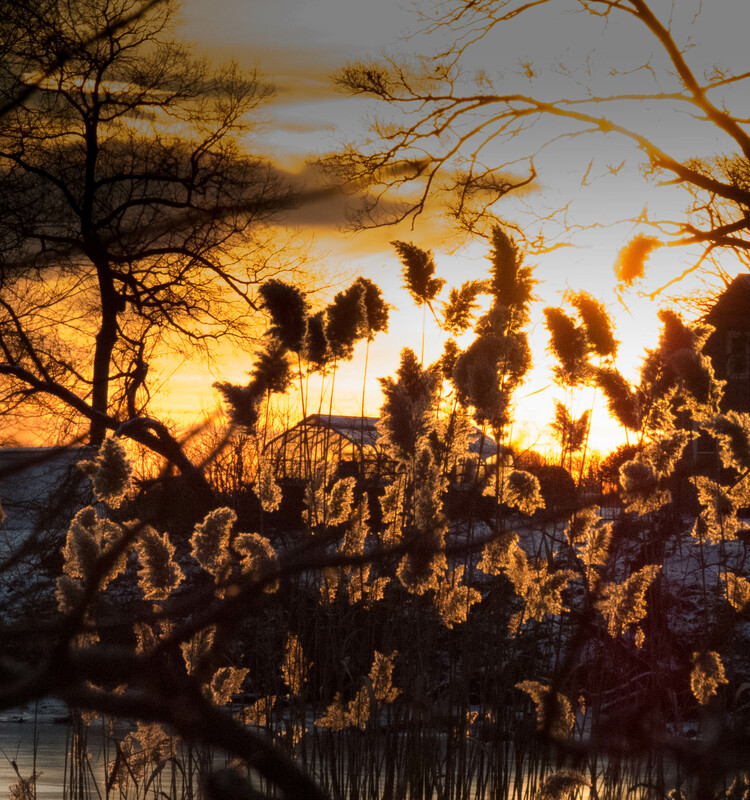 Phragmites become glowing torches. Violent tumult gives way to bursting shafts of light, promising calm to come in an endless cycle of nature. 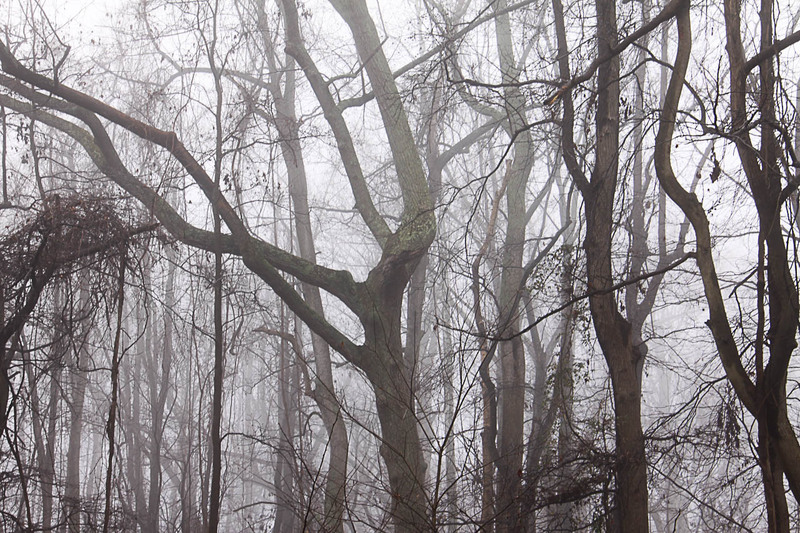 Dense fog invades a shoreline forest, evoking the mystery and danger of ancient Druidic rites. Silence and stillness envelops all. 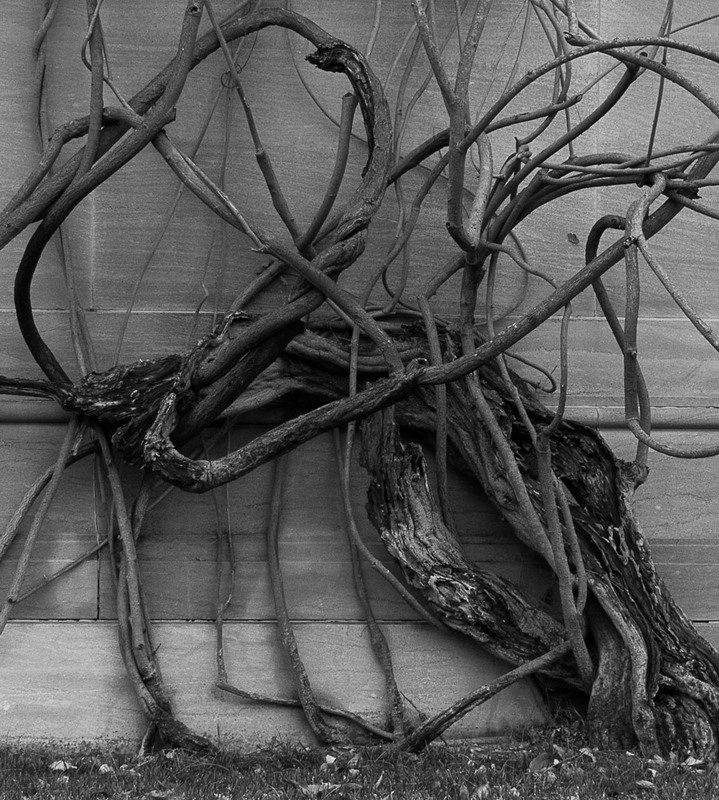 A famous wysteria vine, admired for its spring-time beauty is revealed in winter bareness. Rot and decay are apparent, but it has a sensuous rhythmic power able to resist the restricting geometry of the ashlar stone wall behind it. 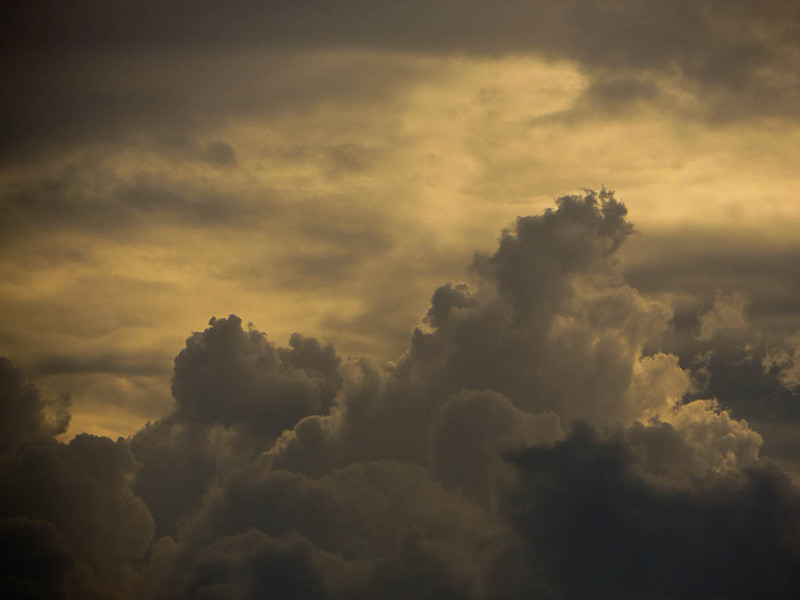 Elemental, unpredictable, constantly changing, clouds are nature in its purest essence. 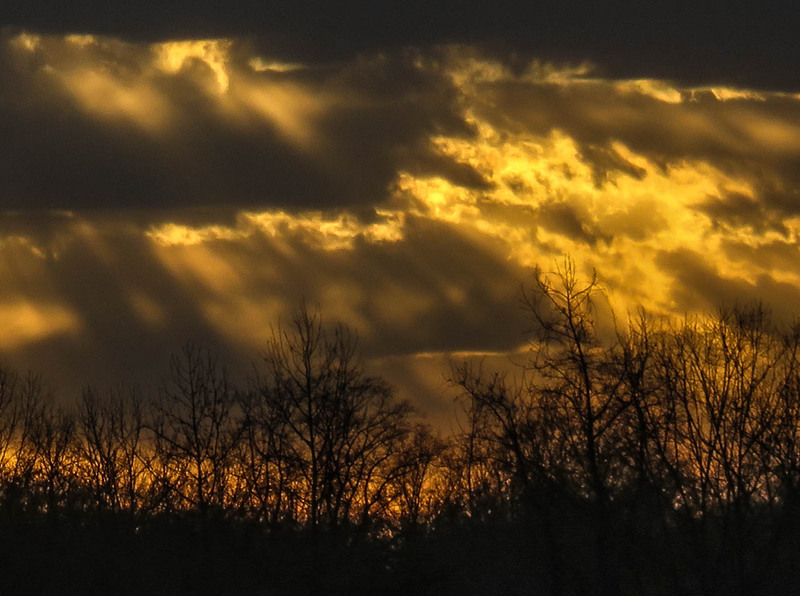 Every human emotion can be stirred by clouds, from terror and despair to hope and joy. This surging, rising mass appeared on the horizon at the end of a midsummer day. The built environment shelters us, transports us, entertains us, limits us, and more. Dizzying engineering, awe-inspiring beauty, and heart-breaking decay are inseparable aspects of what we have done to the world. As destination of accidental encounter, the built environment has been a primary point of interest for my work. 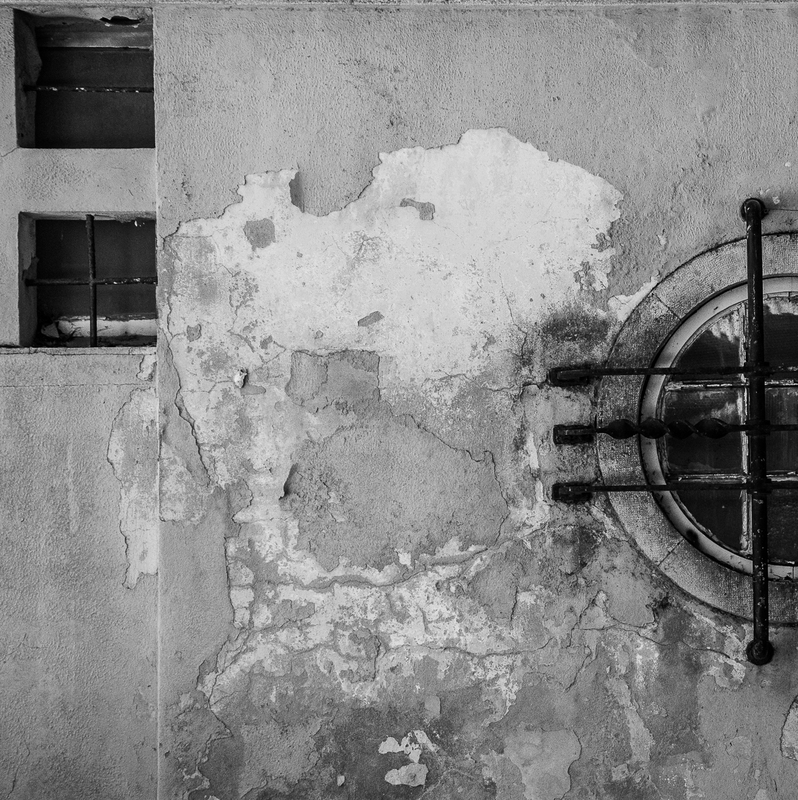 I am more engaged with the patterns and rhythms of structures than their symbolism or impact on humanity. 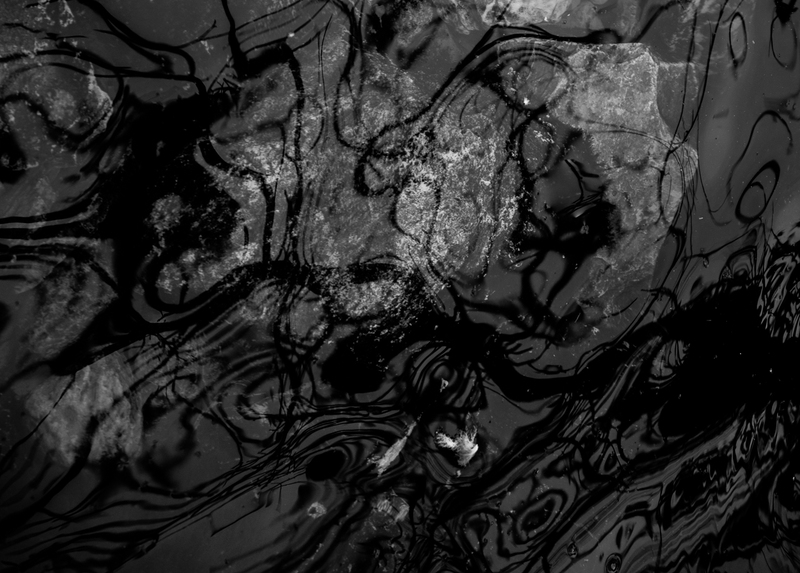 Those elements recede from my vision before the force of powerful design or tumultuous decay. Basic architectural elements of a wall penetrated by openings of the simplest geometric forms presents the foundation of all building. The peeling paint and plaster make obvious the passage of time and the frailty of all constructed things. Anthropomorphically, the very creases and blemishes of the surface indicate the enduring strength of the building itself, like the face of an aged person. The now defunct Hecht Company department store chain in Washington, DC built a monument to commerce in the form of its major warehouse on New York Avenue, a major artery into the city. Crisp, clean surfaces, strong horizontal lines, glazed brick and sparkling glass block walls culminated in a multi-faceted tower at the edge of the avenue. 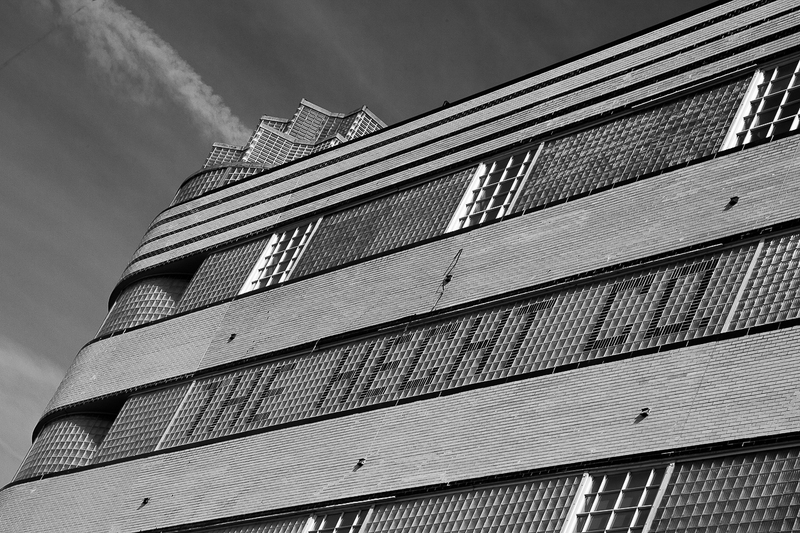 The building announced the success and modernity of the Hecht Company and became a landmark of the city. Today, it houses the condos of hundreds of millennials. I think there's some irony there, somewhere. 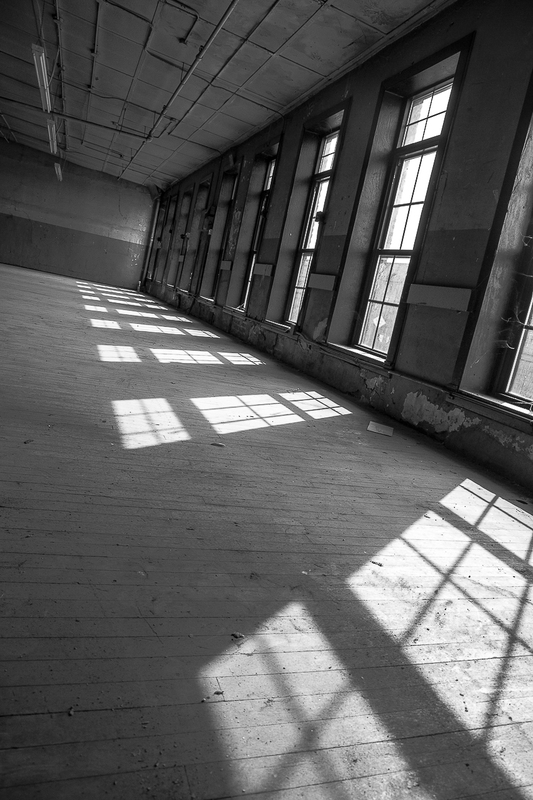 An empty manufacturing building in east Baltimore waiting for a rebirth. Dust-covered floors receive latticework patterns from gaping windows. The world outside swirls forward, while memories of the past slowly gather layers of dust and memories. 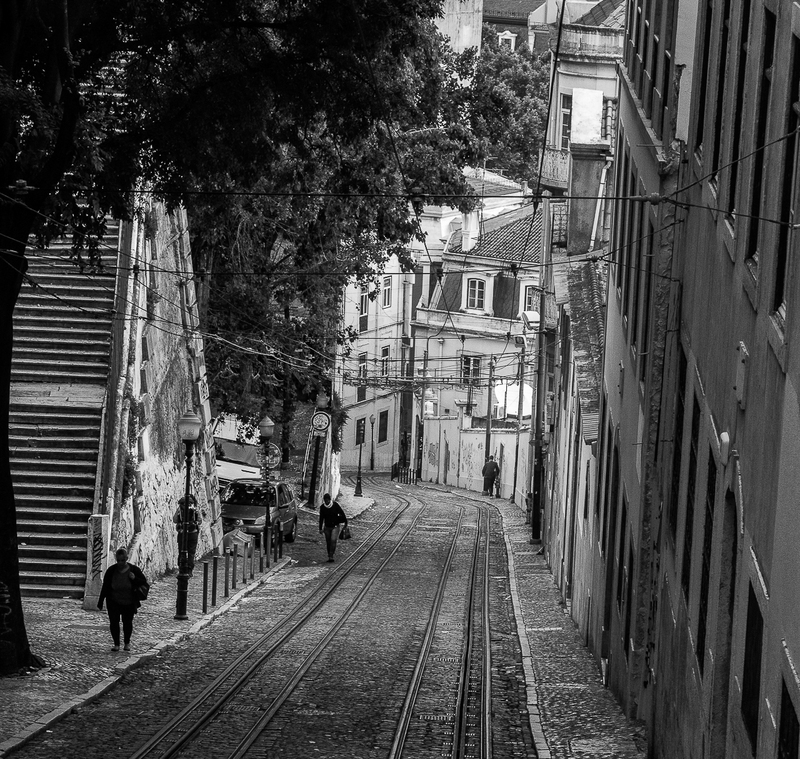 Lisbon, the oldest capital city in western Europe is built upon a series of steep hills. In the nineteenth century modern technology produced funicular railways to aid passage up and down the steepest inclines. Today, these are landmarks of the city. 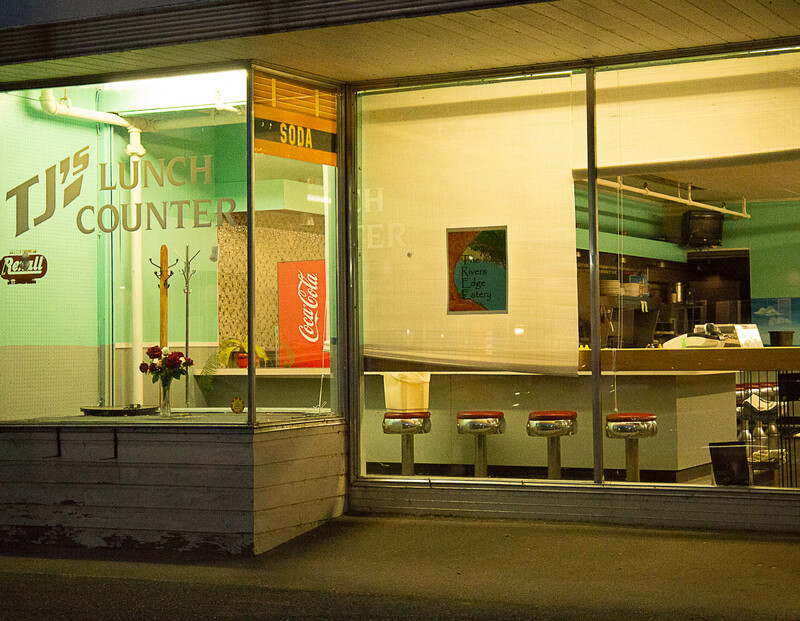 A remnant of another era; the independent lunch counter, an institution of the American industrial century, now replaced by fast-food chains. Empty at 10 pm on a Friday night, TJ's dominates the main street of a northern Vermont town as light pours into the night through plate glass windows. Its simple lines and row of sturdy stools evoke the presence of working men and women who would have occupied them. 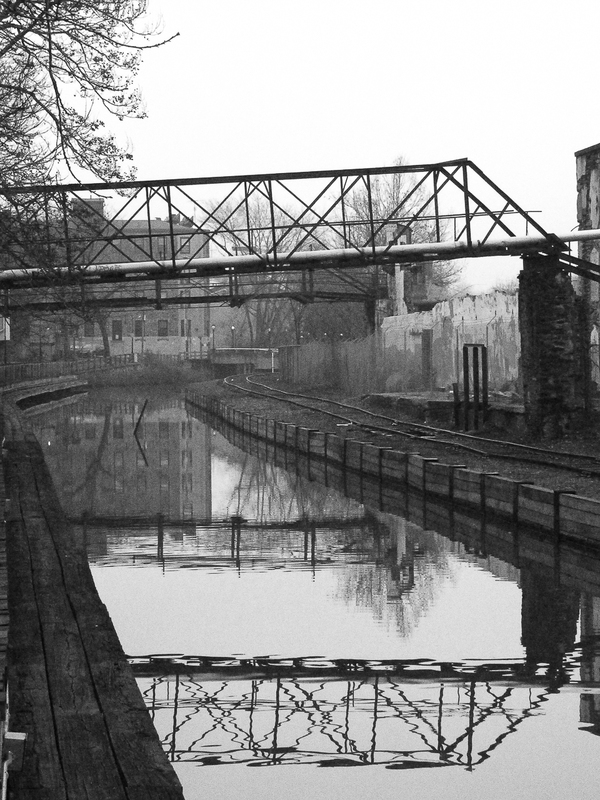 In the nineteenth century the Manayunck Canal was constructed to move raw materials and finished products through an industrial neighborhood of Philadelphia. Now the area has been revived with boutiques, restaurants, and art galleries. The still surface of the canal sweeping around the curve reflects the gridwork of remaining steel and brick revealing a stark, geometric beauty. New England farmhouses grew incrementally over time as the family expanded over generations. There was not master plan. Each addition was created with a specific need in mind and could vary in size. The constants were wooden clapboards, steep roof pitches to shed heavy snows, and durable metal roof coverings. In the late afternoon sun, the deep shadows and sharp angles create a snychopated visual rhythm. 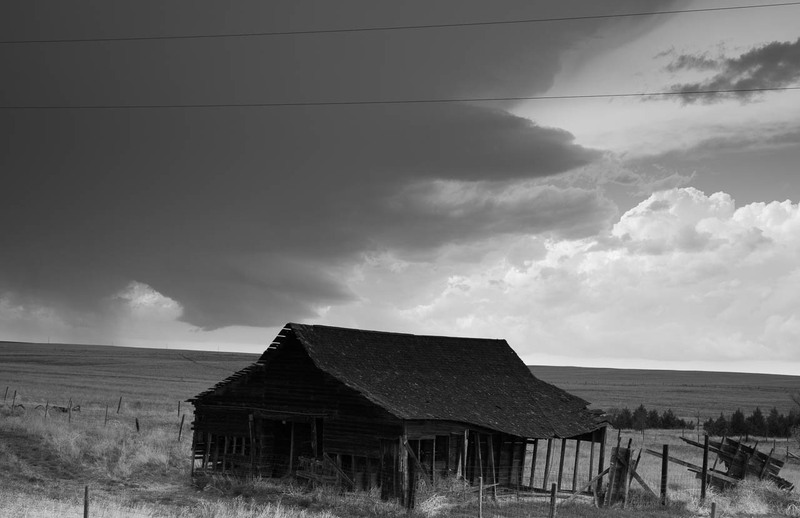 Across wide stretches of the high plains ranchers struggle against the force of nature. 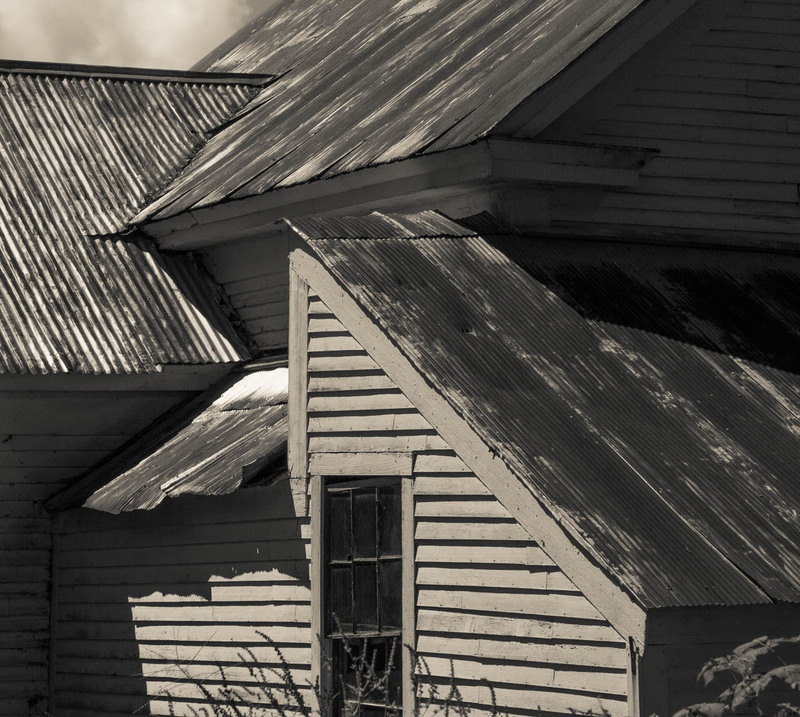 Weathered barns evidence the battering storms and endless force of the eternal wind. A dark and ominous cloud warns of the next onslaught from above. Only the strongest survive. Las Vegas is a mirage in the desert. On the ground it presents the unbridled ambition and wild hopes, alongside the most crushing defeat and hopelessness, of America. 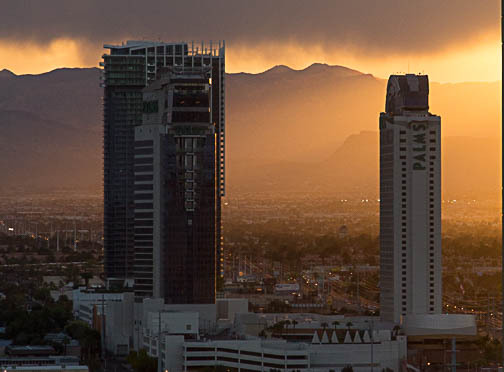 From an upper story of a hotel on the Vegas Strip the setting sun and approaching rain sweeps the towering buildings into the surrounding mountain landscape, hiding the tackiness and sorrow below.